"The runes have spoken. We have our champion...Matthew Thorsen." Why Did I Listen To Loki’s Wolves? I tend to sit up and pay attention when two authors I really like team up and write a book together. Loki’s Wolves is a joint effort between Kelley Armstrong and Melissa Marr, writing as K.L. Armstrong and M.A. Marr. Of course, the fact that Loki’s Wolves has some basis in Norse mythology upped the appeal factor. My expectations, however, did not match the reality. While I certainly enjoyed this audiobook, I would not go so far as to say it is on the level of Percy Jackson. Percy Jackson is probably the nearest comparison I can make to Loki’s Wolves. 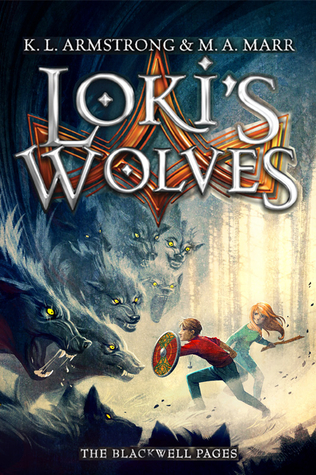 Loki’s Wolves by KL Armstrong and MA Marr is about a group of middle graders who are descended from the Norse gods. These kids have a prophecy to fulfill – they are going to take on the serpent Ragnarok and save the world. Matt Thorsen is a descendent of Thor and you probably wouldn’t believe it to look at him. However, he is the one whom Thor chose. He lives in Blackwell, South Dakota. The other main family in town are the Brekke’s. They are descendents of Loki. As it turns out, cousins Fen and Laurie will stand in for Loki and join Matt on his quest. Along the way he finds other god descendents and forms a bit of a dream team in hopes of taking on Ragnarok. There’s adventure and betrayal. Okay, so the characterization in Loki’s Wolves is alright. I mean, I liked the characters and wanted them to go on to fulfill their destinies. However, I just wasn’t super attached. It irritated me how Laurie basically stands around in the back while the boys get to do everything. Granted, this is addressed eventually but it still rankles. I did love the character of Baldwin though, he is a bit of a hoot. I would have liked more female characters too — as it is three male god descendents and one female god descendent. What Did I Ultimately Think Of Loki’s Wolves? Ultimately, I was not super impressed with this book. As I was listening, I could not help drawing Rick Riordan comparisons. I know, that is on me and my own fault. However, I just was never as compelled by the journey of these kids. It isn’t as interesting as Camp Half Blood. I did go on to start to listen to the sequel which I like a little bit better. Loki’s Wolves has three narrators – Casey Holloway, Jon Wierenga, and Pat Young. I wasn’t totally into this audiobook. It just felt so slow and long, even though it is one of the shortest ones I have listened to in quite a while. I think this was partially because I listened to the audiobook on CD and not via app so I could not speed it up. It felt a bit unbearable. Maybe I would have been more into this book if I had physically read it, but maybe not. Either way, it truly failed to captivate me. The GIF caption says it all. Your review completely sums up my response as well. I really wanted to like it, and could see some potential; but the minute I finished it, I basically forgot it and had no desire to listen to it again.